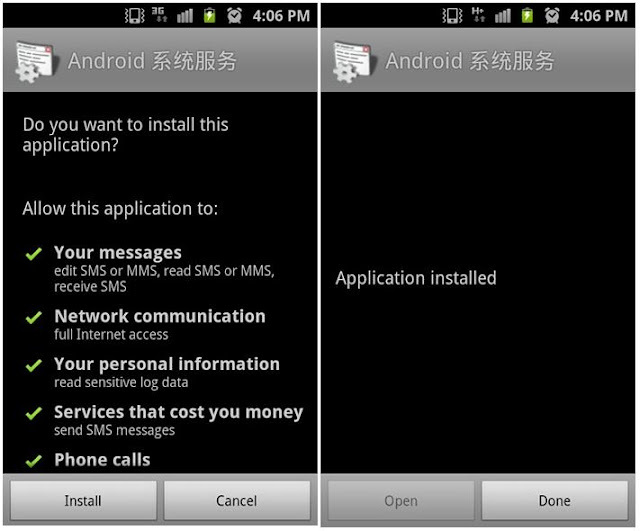 Malicious applications called SMS Zombie have been found in these days. With booming of malicious applications for smartphone, the rumor has that more than 500 thousands smartphone were infected by malicious application. 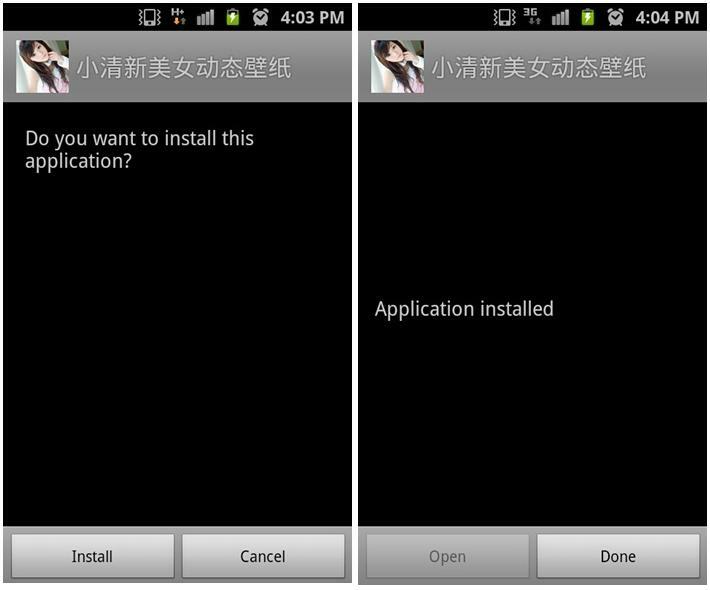 Of course, this malicious app runs for Chinese android smartphone user, they haven't harm to Korean users so far. But the noticeable thing is that the spreading of malicious application for monetary exploitation has been started in overseas countries. This malicious application has been being spread on Chinese unofficial markets as following. This malicious application performs sending SMS without permission, collecting information, and trying to install additional malicious application. Installation screen is as following. It doesn't show permissions for installation and "Open" button is deactivated. It means that malicious application is coded as wall paper type and additional permission for various functions is not manifest but dynamic registration process. Besides, the reason of deactivate of "Open" button is that it runs as a service. 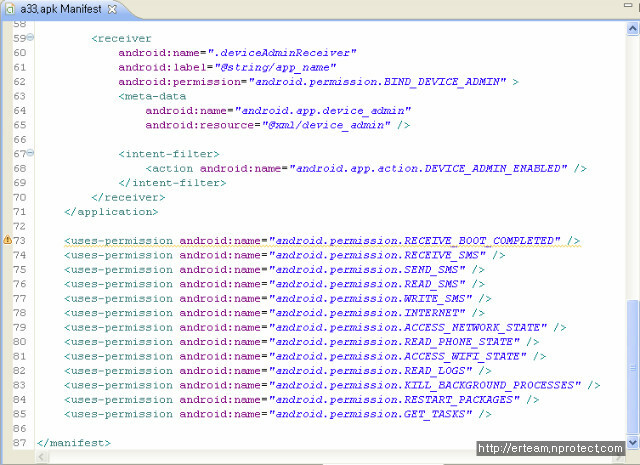 Following image is some part of permission on AndroidManifest.xml. Because this application registered nothing but wall paper service, to activate this program, user have to click following wall paper. Upon executing wall paper, AlertDialog for installing additional application will be shown. Left button is for confirm and right button is for cancel. If a user clicks confirm button, this application will try to install additional files from malicious file. As you see, this file looked like image file, however; this file is APK file. Clicking "Confirm" button can install additional malicious application. Following figure is run screen of additional malicious file. This also runs as a service, so "Open" button is deactivated. 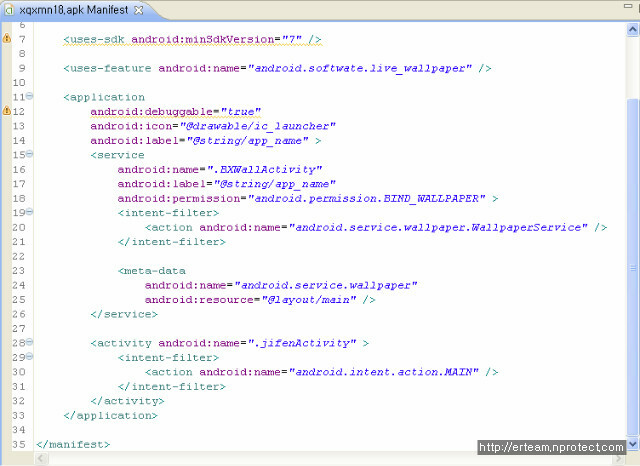 Following figure is some part of AndroidManifest.xml. We can see requiring permission code. After installed, we can see that this malicious application has loaded as a service. Besides, it shows administration activating screen for getting permission as following. As it shows, there are 2 buttons both "Activate" and "Cancel", however; "Activate" button is only working. To click "Cancel" will show Activate device administrator window. Finally, this malicious application will get permission for inducing to click "Activate" button. 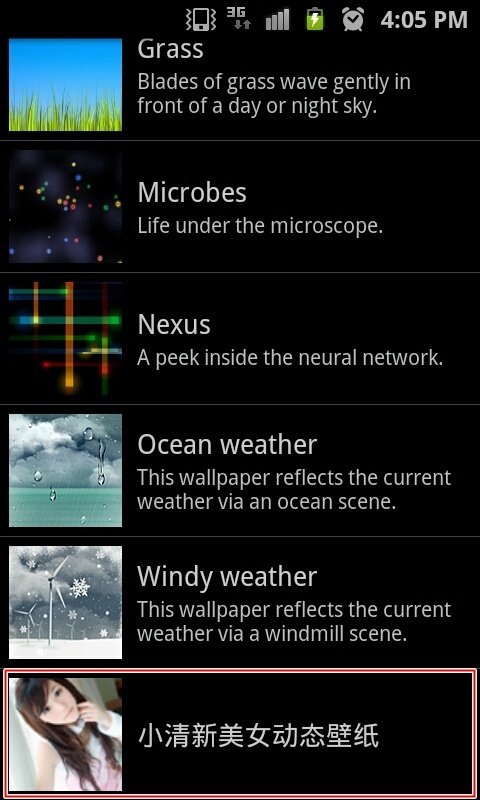 And then it will get various permissions including application removal. Usually malicious applications try to get administrator permission for obtaining its removal rights. 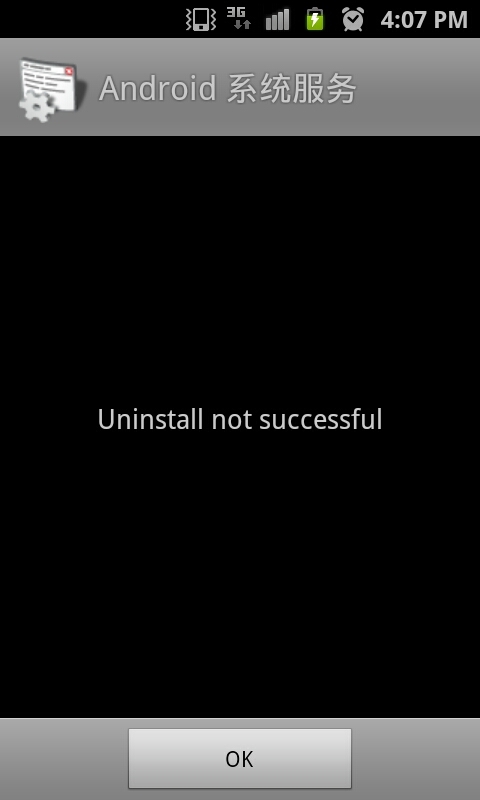 After getting that permission, general uninstall procedure won't work. In case of this kind of application, both malicious and normal types are presence. To remove, following procedure will be needed. "Settings" - "Location and security" - "Device administrators"
Click and choose "deactivate". Of course, clicking "deactivate" seemed nothing to be done. And then hold the home button - "task manager" - "exit all running program" - remove "this application" on program tap. After installation, it will create "phone.xml" on certain path. 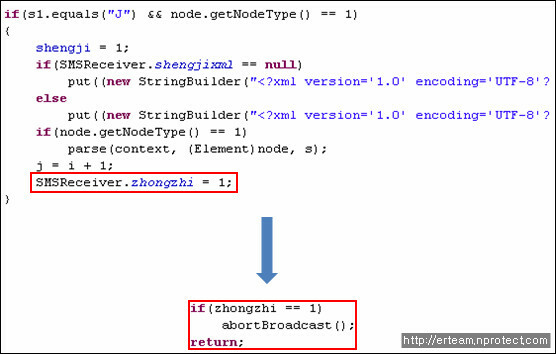 "phone.xml" will contain certain keyword by following code and encoded by Simplified Chinese. 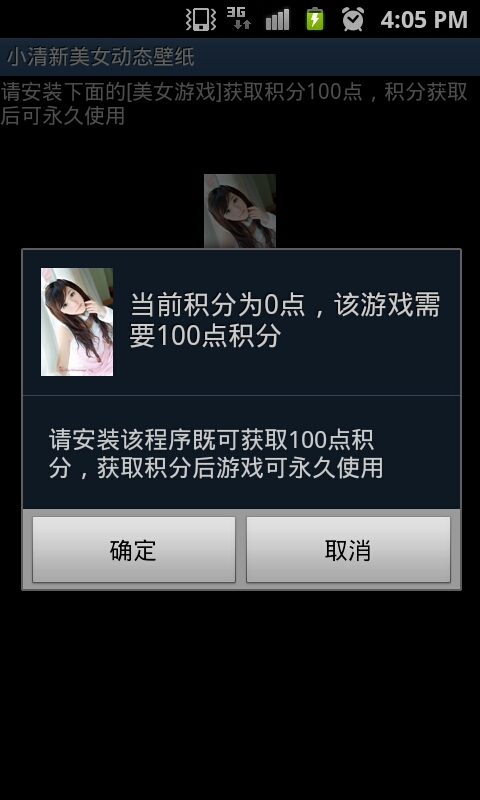 And then, this malicious application will send collected information to certain number(13093632006) as SMS secretly. In case of unable to use wifi, it will send SMS including certain message on following. 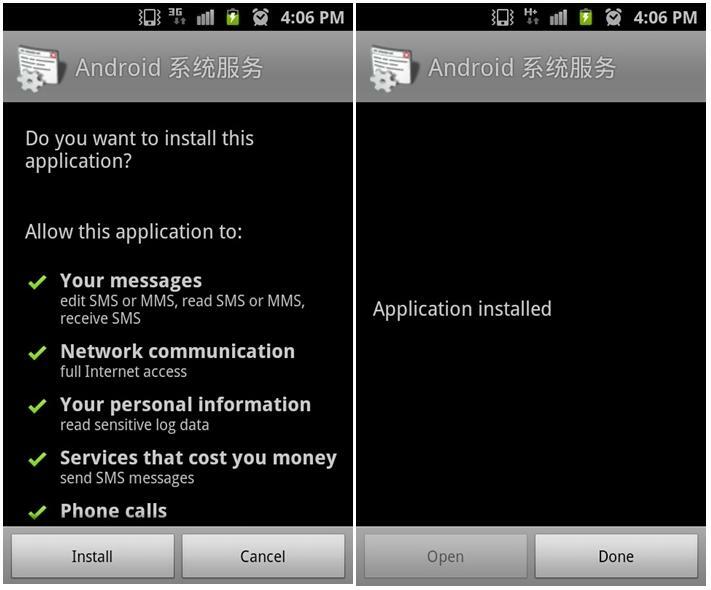 Except this case, this malicious application check rooting status of infected smartphone and sends SMS. This application monitors SMS. 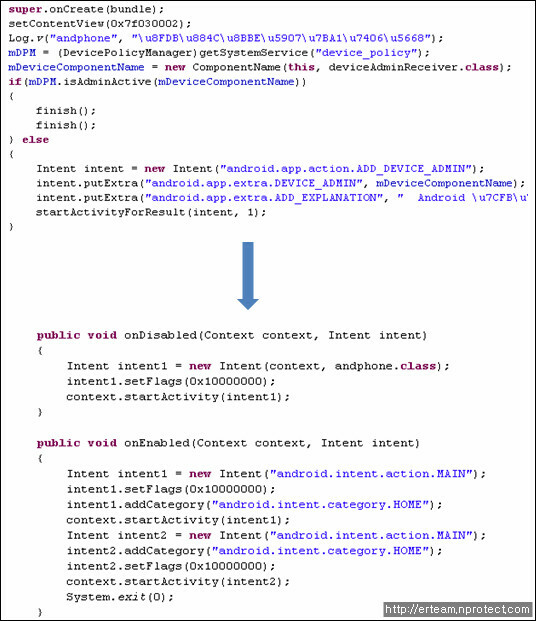 AndroidManifest.xml doesn't contain code for getting permission but its internal code contains dynamic SMS monitoring receiver. It seems that various security solutions may detect SMS monitoring receiver on AndroidManifest.xml. Registered SMS related receiver monitors all SMS which were parsed and compared with keywords in "phone.xml". If string meets condition, it will send SMS to certain number. Some of sent SMS will be removed with following code. In case of this malicious application which contains 1st Dropper, if this Dropper is modified, various security threats can be existed. To use smartphone safely from security threats of these malicious applications, we recommend following tips "Smartphone security management tips" for general users. 1. Use anti-virus SW from believable security company and keep updating the latest engine and using real time detecting function. I enjoyed reading this post it helps me a little bit and gives me an idea on my business for sms. thanks for this! You can check them out and select one for your phone. Download new kik spy app here my friends! Help from online sources: Other than libraries, there are many assignment help online services which can take care of the sources you need during your study. There are e-Books, articles, and videos which will explain each concept very precisely. The editing and proofreading services may not be the most popular online services among the students, but they certainly play an essential role in preparing a quality assignment. If you are one of those students who submit their assignments without having a second look on them and then blame the professors for not awarding you with better grades, then this is the perfect opportunity to learn what went wrong. When you are provided with a lot of homework, the first thing which comes to your mind is if somebody could help you out. Today, we all lead a very hectic life, and there is no exception in a student’s life. To cope up with the existing competition students are often enrolled in several skill-building classes as well as extra academic courses. Hence, the students are left with no time to complete their homework accurately. This is why many companies have come up with their primary homework help services to assist them. Get best Australia assignment help service by top academic writers at No.1 assignment assistance provider company My Assignment Help OZ. Get top quality assignment help in Australia by most reliable Australian academic assistance provider company. I have read your blog thoroughly you mentioned very good things in this.but you can improve this more by our online assignment help services. Students Assignment Help offers its qualified assignment writers from reputed universities around the world who are fluent in academic assignment writing and offers its best instant assignment help to the students. We deliver the assignments before the deadline.